This male Ruddy Duck (Oxyura jamaicensis) and I spotted each other at almost the same time and we both immediately sprung into action. As I was bringing my camera up to my eye, the duck was swimming away. I thought that I had lost the photo opportunity when suddenly the duck turned his head to the side and I was able to capture this image. 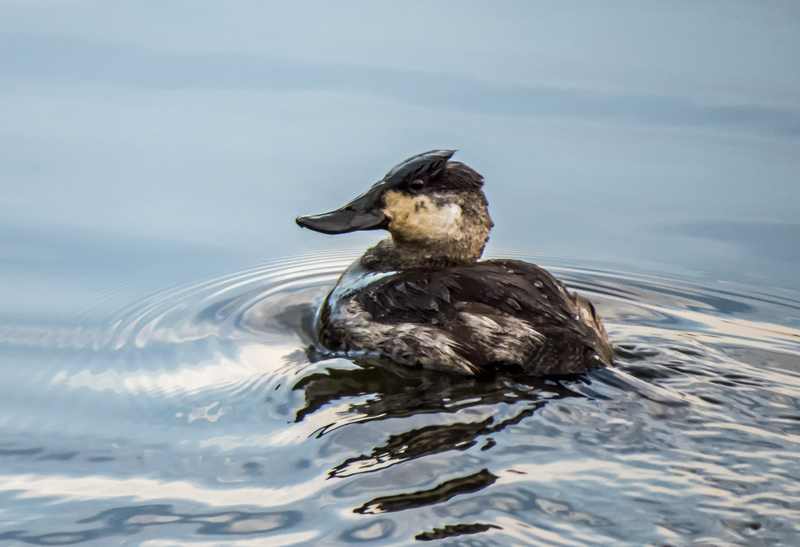 This Ruddy Duck, like the Hooded Merganser duck that I featured yesterday, has taken up residence in a small pond in a suburban neighborhood not far from where I live. I am thrilled, because it gives me a place where I can experience wildlife without having to travel too far. Things can get busy sometimes, especially at this time of the year, and I cannot always spend hours on end in the wild with my camera as I prefer to do. Now isn’t that a ripper of a photo, wow! The duck’s unusual head and bill shape seem to be echoed in the ripples of the water! The duck is a real little character and the water is simply amazing.. this is a poster duck, I’d be glad to hang that photo on my wall! Nice Mike! One of my favorite ducks!